We all know how painful it is when important data gets lost, therefore, it's better to back up your iPhone iPad frequently, and also backup it before upgrading to iOS 12. DearMob iPhone Manager is a professional “Data Manager” tool that can help you backup and restore your iPhone data. Focusing on safety, speed and stability, it’s with powerful functions can fully backup and restore all iOS data or specific files including photo, music, video, book, contact, SMS, etc. We highly recommend you give it a try ASAP to back up your iPhone data. Operating the software is as easy as simple clicks provided in the interface. At first, DearMob iPhone Manager comes across as a straightforward application with few features and options. However, there is more than meets the eye. On running the application for the first time, it is fine to think of this Content Management, Encryption and Backup & Restore software as simple given its clean interface with nicely arranged options. And it provides other options to backup specific data by clicking the relates icons on the main UI. The installation process is simple and straightforward, taking no time at all to complete. After the installation the application takes small space. Launching it for the first time, the application can easily be registered and activated for use, by entering the registration code and licensed email. Once installed, DearMob iPhone Manager can be understood in three heads, Content Management, Encryption and Backup & Restore. – A lot of features. – Can easily sync your files with no issue whatsoever. – Military grade encryption is a cherry on top. – Supports backup & restore of wide range of formats of Images, Videos, Audios, Office files, and more. – You can preview the files before backup. 1. Photo Transfer. Two-way sync to transfer photos between iPhone iPad and Windows/Mac computer. HEIC to JPG photo conversion is also possible. 2. Music Sync. Even the iTunes purchased songs can be exported to computer, M4P files to MP3/AAC. 3. Video Management. Options to import & export videos, convert Apple unfriendly MKV, FLV to MP4, and compress large video files. 4. Backup and Restore. 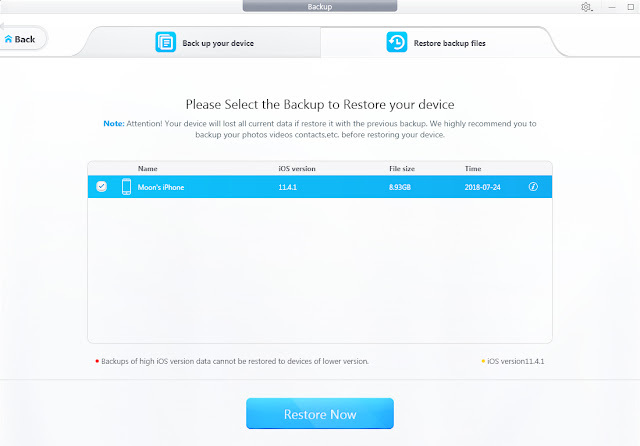 One click to backup or restore all iPhone data on computer. 5. App Management. It is a good addition to the program to allow us install the Apps that are not in App Store without Jailbreak. As of now, DearMob is compatible with both the Windows and Mac. So, the iOS device manager is priced at the cost of $39.95 for one year subscription with a Windows or Mac. On the other hand, the lifetime license for two computers is priced at the cost of $47.95, and for a lifetime family license is available at a cost of $69.95. 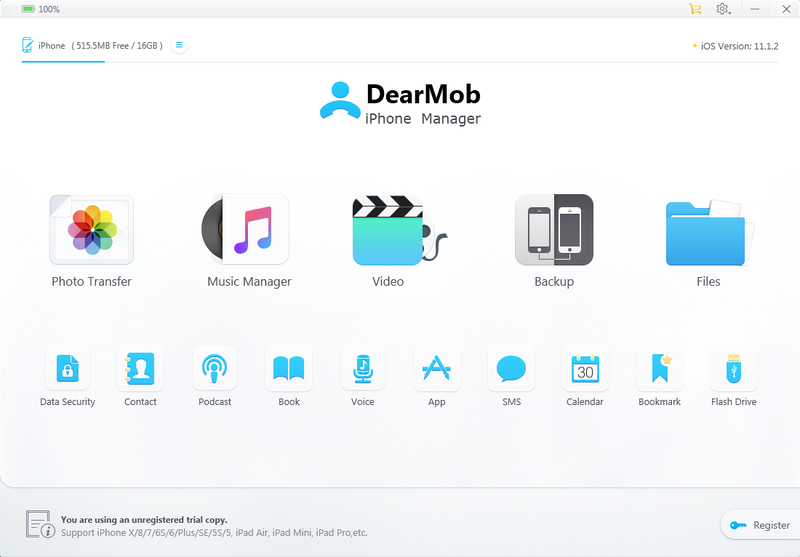 If you own an iPhone or any iOS device, then DearMob iPhone Manages Software is the ideal to help you backup any data .You can easily and quickly backup iPhone photos, files, music, calendar, memos, apps, SMS and many more things on the go. And whenever if you find that your device is not working properly or smoothly with some of the stubborn issues like unresponsive touchscreen then you can easily restore with an ease. Once you want to switch to new iOS device, just restore the backup of old iPhone to the new one. The program is bundled with fantastic features and runs smoothly, without and lag or crashes. And yet very simple to use and operate. All you need to do is to connect your iPhone or iPad with Windows or Mac computer. It doesn’t get any simpler than that, It is worth-trying.